The week saw the Merv (Britain's version of the Bernank) step forward and utter excuses as to why he now expects UK inflation to 'temporarily' soar above 5% this year on the official CPI measure (that significantly under reports real inflation as experienced by the general population). Mervyn King in a smoke and mirrors presentation all but blamed speculators for the surge in commodity prices with expectations that UK energy prices would surge by 15% later in the year. So I guess after spending the whole of 2010 pumping out always temporarily high inflation now the Bank of England is getting ready for shock and awe 5% CPI inflation statements, add to this the Deputy Governor of the Bank of England going on to blame speculators for the surge in commodity prices, and intends on wasting millions in tax payers money by taking part in an international study into the impact of commodity price speculation on inflation. All of this is smoke and mirrors propaganda, why ? Because the Government / Bank of England Wants / Needs HIGH Inflation, and has done so since the start of the financial crisis several years ago, as I will illustrate in this article, high real inflation remains the ONLY response that the Government and it's central bank have to deal with Britain's debt crisis (ever increasing debt mountain) as the alternative is to go down the same path as bankrupting Greece of a deflationary spiral, it's just that the powers that be perceive (correctly) that an inflationary spiral as being more palatable to the electorate / general population as they have nominal statistics thrown at them that paint a picture of everything getting better when the truth as personally experienced is the exact opposite in real terms. The Bank of England also downgraded the UK economies GDP growth forecast for 2011 to 2%, down from 2.8% which is trending towards my forecast as of August 2010 (UK Economy GDP Growth Forecast 2010 to 2015 )that the UK economy would grow by 1.3% this year. The updated in-depth analysis and forecast for UK inflation for 2011 (17 Jan 2011 - UK Inflation Forecast 2011, Imminent Spike to Above CPI 4%, RPI 6% ) concluded in UK inflation spiking to a high of 4.2% early 2011, and thereafter trend lower towards 3% by the end of 2011 and therefore remaining above the Bank of England's 3% upper limit for the whole of 2011. This weeks Bank of England Inflation Report now forecasts UK CPI of 4% by the end of 2011 which represents a sizable jump from the last report of 1.7% by the end of 2011. If Britain's working and middle classes were not being squeezed enough by persistently high inflation that is currently eroding purchasing power of earnings at the rate of 3.5% per annum (RPI-Earnings), are now also being increasingly hit by a series of tax rises and benefit cuts that collectively look set to erode average purchasing power by between 15% to 25% over the next 2 years, after having already suffered negative earnings for the past 3 years as illustrated by the below graph. The mainstream financial press appears to flip flop on its expectations for the prospects for UK interest rates virtually every other week. Just over a month ago in March, the mainstream financial press had collectively convinced themselves that a May rate rise was virtually a done deal, then having failed to materialise the press flopped to expect no rate rise for the remainder of the year, now after heard Merv's Inflation fears statement they are again flip flipping for an early rate rise. 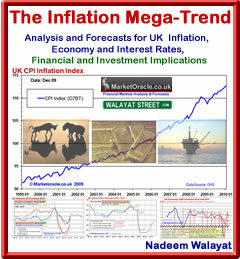 The recent (March 2011) 85 page Interest Mega-Trend Ebook (FREE DOWNLOAD), concluded in expectations for 1 or 2 token UK rate hikes with the first rate rise expected to occur in June / July 2011, and longer term expectations for UK interest rates to hit a minimum of 4.5% by the end of 2014. The bottom line is that the central banks CREAT inflation by means of PRINTING MONEY (in its various forms from fractional reserve banking to Quantitative Easing), if they did not print money then there WOULD BE DEFLATION, as that is NORMAL for a stable monetary environment as technologically development would result in FALLING PRICES, but the central banks cannot STOP printing money as that is the primary means of TAXING 99% of the population. Western governments such as the UK and USA are printing their way out of their fiscal crisis whilst emerging markets have soaring demand for commodities, goods and services and are exporting their inflation abroad so as to prevent their populations from revolting over ever higher food prices. The Bank of England remains paralysed by the fear of another banking sector financial armageddon, and is continually pressured by the UK government that seeks high inflation as a means of making stealth deep real terms cuts in public spending, the deficit and total accumulated debt, thus the British economy is being sleep walked towards a wage price inflation spiral, as people will increasingly refuse to be lied to anymore and start to demand wage rises in line with real inflation. Look the facts are as illustrated in the UK Sunday Times Rich List which saw the wealth of the 1000 richest people in Britain increase by 18% over the past year whilst ordinary people have seen the purchasing power of their earnings shrink by an average of 3%, a lot of smoke and mirrors have to be utilised by these 1000 ruling Oligarch's to ensure that the masses do not revolt but instead are forced to pay higher taxes and have their savings inflated away as the super rich Oligarchs DO NOT pay the same rate of tax and evade the consequences of inflation stealth tax by means of central banks funneling cash through various means into their back pockets such as the inflating of stock prices by 100% in 2 years, and the situation is even worse in the United States. The connection that the mainstream press has never been able to make is that the Bank of England does NOT make Forecasts. Instead the Bank of England quarterly inflation forecast reports are nothing more than ECONOMIC PROPAGANDA, that virtually always converge towards the Bank of England achieving its 2% Inflation target in 2 years time, despite the fact that historical analysis shows that the Bank of England FAILS in achieving its 2% target 96% of the time. The following are the last 6 quarterly Inflation forecast reports by the Bank of England issued from February 2010 to May 2011 that were instrumental in academic economists and journalists in the mainstream press regurgitating the always temporarily high inflation mantra during 2010 and into 2011, despite current CPI of 4%. UK Inflation by Feb 2010 had as I anticipated spiked to above 3% (27 Dec 2009 - UK CPI Inflation Forecast 2010, Imminent and Sustained Spike Above 3%). However the Bank of England's Feb 2010 Inflation Report forecast the spike as being temporary and to imminently resolve in severe disinflation to target a rate of below CPI 1% by December 2010, instead actual UK Inflation for December was 3.7%. The forecast for end 2011 was just 1.2%. The current inflation report (May 2011) has now revised for UK Inflation for end 2011 to approx 4%, compare that against a range of between 1.2% and 1.7% pumped out as deflation mantra during the whole of 2010. As ever the ongoing rise in inflation is deemed to be TEMPORARY with UK inflation, you guessed it, to again as if by magic converge to below 2% in 2 years time, now forecast to target 2% by the end of 2012. Can You See through the Bank of England Inflation Forecasts Smoke and Mirrors? The Bank of England's Inflation reports clearly illustrate the persistent trend as was the case for virtually every preceding year in that the Bank of England ALWAYS FORECASTS SUB 2% INFLATION in 2 YEARS TIME. The inflation graphs clearly show that actual inflation tends to be significantly above the BoE's forecasts and usually by a wide margin of as much as 2.5%, with the 1 year forecasts in even greater error that supports my long held view that the Bank of England's Inflation forecasts are nothing more than economic propaganda so as to make the Banks job easier in managing monetary policy, especially as the Bank of England remains terrified of another potential Banking Sector induced Financial Armageddon. The bottom line is that those at the helm of the economy and in charge of managing inflation / growth by their public statements imply that don't have a clue as to what is actually driving inflation today, instead they make rear view mirror looking statements of yesteryear and extrapolate into the present. The reason why we have high inflation is because the world has 7 billion and growing hungry mouths to feed, then throw into the equation some 300 million newly created middle class Chindian's (China+India), that is growing at an estimated 40 million per year, all with the same appetites as those in the west, then its not just the UK that has an inflation problem but the WHOLE WORLD ! Welcome to the GLOBAL Inflation Mega-Trend. So I am afraid the apparent fools sat around the Bank of England's MPC table (collecting fat tax payer funded pay cheque's) will only realise this perhaps 2 years down the road when so called temporary high inflation passes its 3rd anniversary. If the Coalition government were serious about managing the economy and solving Britain's economic and inflation crisis then the first step they should take is to fire ALL of the members of the MPC! The Eurozone piling more debt on top of PIIGS existing debt mountains as economies contract, such as Greece contract under the weight of economic austerity all without the mechanisms of stealth default by means of high real inflation (debasing ones currency) has always ensured that debt default for many countries such as Greece is INVETABLE. I covered many of the solutions being voiced in the mainstream press today as Greece leaving the Euro over a year ago(11 May 2010 - E.U. $1 Trillion Bailout, Detonates Nuclear Option of Printing Money to Monetize PIGS Debt). Now a year on from the last bailout and a matter of days after bailing out Portugal, Greece has progressed further on the road towards outright default as the economy deflated by 4.8% over the past 12 months whilst it saw prices inflate by 3.9%. Therefore all the Eurozone can do is to work towards another bailout in an attempt to again delay the inevitable, and so to speak kick the can down the road. The closer Greece gets towards defaulting on its debts (restructuring) then the greater will be the pressure Greek and other European Banks are put under as investors flee in the face of another series of investor wipeout bailouts as have occurred during the past 3 years. As ever the risk of banks going bankrupt and taking savers depositors down with them remains which still means that UK savers need to ensure that they do not deposit more than £85k (compensation limit) with any one banking group as I covered at length in a November 2010 article - Protect Savings & Deposits From Banks Going Bankrupt! We are ruling out default in any form, There's no question either of Greece leaving the European Area. I want to reassure investors. Which translates into that there WILL be another bailout for Greece, and then possibly another one after that, but a Greek default is CERTAIN, why ? because the alternative is that the whole country will be owned by foreigners ! A stealth conquest of Greece by predominantly German and French banks. Which appears to be the consequences of the single European currency, that all assets each Eurozone country owns are slowly gravitating towards being owned by mainly Germany. Britain is Not Greece, Portugal, Ireland or Spain. Unlike Greece, Britain has kept interest rates near zero, devalued its currency and can print money through many mechanisms such as QE and inflate its way out of soaring debt (% of GDP) none of which are available to the eurozone PIIGS that are locked into a death spiral of ever higher debt burdens (% of GDP). This is why whilst Britain's budget deficit is greater than that of Portugal's but its debt interest rates are on par with that of Germany, as the risk of outright default is significantly lower (at this point in time) and I am sure that the Euro-zone is grateful that the UK is not part of it, for it if where then France and Germany would probably have had to have bailed out Britain! In fact given the size of Britians private and public debt mountain that is more than £5 trillion, the Euro would probably have been ripped apart a year ago if Britain had been part of it as a bailout of Britain would have bankrupted France and Germany, instead the workers and savers of Britain are paying 100% of the price. However, whilst the financial & banking system picture may appear more stable in the UK as long as economic austerity measures are seen to being implemented to stabilise debt to GDP, this does mean as illustrated earlier in this article that 80% of the population that represents the working and middle classes will pay a very heavy price for the stealth debt default by means of high inflation as the purchasing power of earnings and savings are eroded away, representing a loss of upto 25% of the purchasing power of their earnings over just 2 years (the very poor on benefits and the super rich evade most of the consequences of economic austerity and high inflation). The pain WILL be increasingly real and unprecedented, and I expect it to hit peoples most prized asset class hard despite high inflation, which is the Housing Market, more on this in a series of articles that will conclude towards a detailed trend forecast for UK house prices for several years which aims to replicate the accuracy of past housing market analysis such as the August 2007 that called for a 2 year bear market into August 2009 (UK Housing Market Crash of 2007 - 2008 and Steps to Protect Your Wealth ). The bottom line is that nothing has changed, no debt has been repaid or likely to ever be repaid which means the debt burden today is greater than a year ago and will be greater still a year from now, the same holds true for virtually every western country. Britain remains on the public debt trajectory as last analysed in June 2010 (UK ConLib Government to Use INFLATION Stealth Tax to Erode Value of Public Debt ) and little different to that which the country would have faced under a Labour government, which is for a 50% rise in public debt on 2009-2010 by 2013-14. Which is why Inflation was, and is the ONLY response that the government / central bank has to reduce the growing debt mountain's value in real-terms, else the UK would be exactly where Greece and the other PIIGS are today, facing outright default and bankruptcy as a consequence of contracting economies and growing debt mountains. The governments primary objective is to stabilise debt as a percentage of GDP, which the June 2010 analysis confirmed is possible given an environment of high inflation for many years and economic austerity that will contribute towards restraining the previous Labour government's exploding debt mountain in real terms, as it caps spending budgets in real terms as well as inflating away the value of debt by a good 4-5% per year as nominal GDP is inflated thus giving the population the illusion of economic growth something that the PIIGS governments are unable to do. So, remember that whatever propaganda the government or the Bank of England pumps out concerning temporary high inflation that is always destined to fall, that is NOT possible given the primary objective for stabilising debt to GDP, without which market interest rates would be more than double where they are today and Britain would be facing an out of control debt interest spiral along which lies an hyperinflationary economic collapse as people lose confidence in holding sterling. That is the big picture, of stabilising Debt to GDP before it takes off into the stratosphere. Therefore, under these circumstances, as I covered at length in the Inflation Mega-Trend Ebook, a low inflation environment is just NOT possible, Inflation will NOT be at 2% in 2 years time as the Bank of England keeps pumping out, it will remain at at least twice that level for at least the next 4 years and probably longer still given the fact that the Coalition Government will aim to create in illusory inflationary boom in the run up to the next general election in 4 years time. It looks like most silver bugs got swept away by the bullish hysteria that is associated with parabolic moves, with outlandish forecasts emerging just as silver was peaking at $49, forget $75, $100 was just a matter of weeks away when the resulting reality was that of a 33% price crash to below $34. My quick take as someone who is watching from the side lines is that the silver price ran way ahead of itself when compared against the Gold price (See Inflation Mega-Trend Ebook analysis on the Gold / Silver Ratio), in fact it STILL remains expensive when compared against Gold, so on a fundamental basis I can't see a sustainable run up in the silver price on the horizon. If anything we could see Silver after a short-term bounce to $40 from technically oversold levels trade to below $30 and lower still if the Gold price also significantly weakens. So Silver bugs, despite the 33% crash, Silver is still not cheap relative to gold, keep your eye on the gold price, and don't get married to your positions as Silver has always been one of the most volatile markets to trade, and given the relatively mild reaction in the Gold price which suggests that is where precious metals investors should be focused. Probably both gold and silver will make an intermediate low next month. Gold's major support is 150 day MA as usual, silver's is 50 week MA, lower than expected. How does the inevitable defaults of the PIGS despite the bailouts (just kicking the can down the road as you say) correlate with your view for the continuation of the stock Market boom ? Surely an imminent Euro crisis/financial crisis part II would mean a return to bear market conditions ? Yeah. It's getting hysterically funny how these inflation "blips" are only ever temporary and will work themselves out of the system in the next 12 months so no one is disadvantaged. Sheesh! Words fail me. Glad I don't believe a word of this crap from these proven liars and fools. Nadeem - approx 80% of UK government liabilities (state & public-sector pensions/gilts/PFI etc) are index-linked! So surely "printing" is not the answer, is it? Politicians print money to buy votes, therefore voters want politians to print money hence why the central banks print money. The politicians are currently engaged in trying to swtich everything from RPI to CPI because over the long-run CPI averages half the inflation rate of RPI. Whilst REAL inflation is between 6% and 7%. So yes, they can only print money and inflate so as to get people to pay the price 'stealthly' without them realising it. Work harder for less real terms pay is the name of the game being played. There are a lot of ex civil servants on index-linked pensions, but they are being screwed, too. Most of them simply don't know it yet. The indexation used to calculate their pension rises has been messed around with so as to show a lower figure than reality. Hence, as long as the governments can get away with printing more money and keeping people credulous to their "official figures" then they can basically wipe out, over time, even those fortunate enough to be in receipt of enhanced pensions. Will you be buying silver in the support zone? Everything else, including silver I accumulate when its cheap and sell when its expensive, some times it can take months, but usually several years. Virtually all of my silver was bought at a price under $14,and 100% is what I aim for to bank profits. There are many, many markets out there that are constantly cycling between extreme lows and highs, so investors should not get carried away with obsessing over a single market. Personally, $30's does not entice me to look at silver, nor does $20's, now IF silver dips below $20, then that would entice me to start accumulating again. Which markets do you think are at extreme lows right now? Well, natural gas appears to fit the bill (last time I looked at it). Currently, the bulk of my commodities investments are in oil and agriculturals. Remember I invest, not trade commodities, so I am only interested in accumulating when they are cheap, and let time give me the price spike to sell into. In relation to Agriculture, how does an investor play this? Foods do appear to be the cheapest of commodity lot. 01 Jun 11, 11:12 Recommended books on Elliott Wave Theory? Hi Nadeem, I admire your analysis and would like to know if you could recommend any books on EWT. I'm very interested in learning about it. Theres a lot of free material out there on the net. Possible problem with EWT books is that they are too biased and not objective enough. Your property analysis is coming in June right? I need to get started on this stuff, start getting some yield! Can you discuss the potential risks and stuff for buy to let investors, with your usual foresight over what the gov is likely to do and forecasting etc. Are you selling the dollar right now too? Hi, we have not heard from you in a while are you on vacation or just engrossed in something else? As the US economy weakens, the Dow Jones Index leads world stockmarkets lower. Is it time for another DJI analysis? Have we had a re-evaluation of the £/$ as we're way off on the 1.80-90 target half way in the year. Whaat do you think a slow down (or collapse) in Chinese real estate will have on the global commodity and stock markets? I will try include an update in my next newsletter. Pound target, the problem is that all currencies are in freefall, so the exchange rates are volatility in the rates of freefall. There never is any gain in a currency, (unless you have deflation).